Note: The 1067_0B is identical to the 1067_0, except that you have the option of whether you want to include the USB cable. 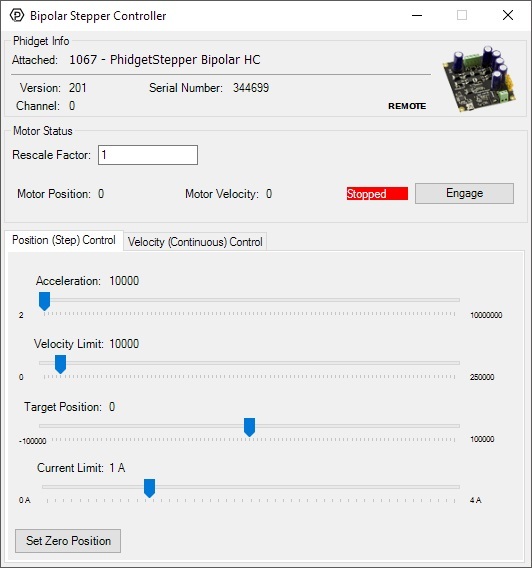 The 1067 – PhidgetStepper Bipolar HC allows you to control the position, velocity, and acceleration of one bipolar stepper motor. This is the product you want to use to control larger industrial steppers or for applications that need a lot of torque. The 1067 can also be used in applications that require very precise positioning. It uses micro-stepping at all times to ensure smooth acceleration. This board is USB isolated, protecting your system from ground loops, and comes with a built-in replacable ATP Blade Terminal fuse to protect against an over-current scenario. When using larger motors with heavy loads or high speeds, you should take caution because the back EMF generated when stalling or changing directions could damage the motor controller. As a rule of thumb, if the kinetic energy of your application exceeds 10 joules, you are at risk of damaging the controller. Feel free to contact us for advice for such applications. We do not carry enclosures for the 1067, because motor controllers are prone to overheating when kept in enclosed spaces for extended periods of time with no airflow. The 1067 can control both unipolar and bipolar motors, but in almost all cases you're better off with a bipolar motor due to their increased power and more precise step angles. If you care about torque, large motors with high gear ratios are your best bet. If you car about speed, motors with no gearbox and high step angles are better. If you want precision, steppers without gearboxes and low step angles are best because while gearboxes do result in smaller steps, they also introduce a flat 1-3 degrees of positional error due to backlash in the gears. This Phidget requires a power supply between 10 and 30V DC. 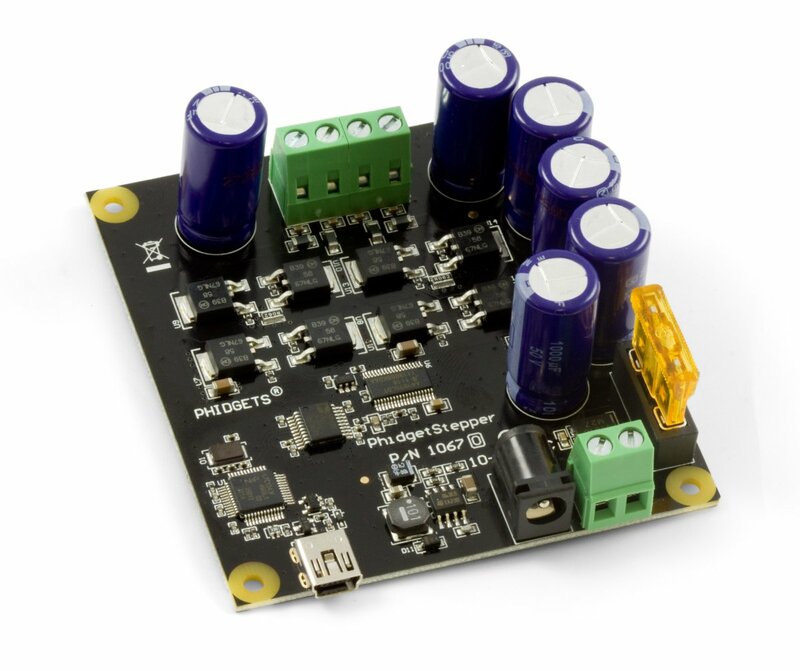 We recommend that you use a 12V DC power supply for small steppers and a 24V DC supply for larger ones. If you're not sure, check the data sheet for your motor for the recommended power supply voltage (not to be confused with the coil voltage, which is usually much lower). For best results, we recommend getting a 5 amp supply. Select the power supply from the list below that matches your region's wall socket type. The PhidgetStepper Bipolar HC comes with a 5 amp automotive fuse. 3.1 How does the 1067 control Stepper Motors? 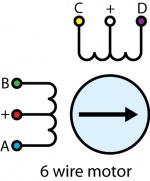 Connect the motor to the PhidgetStepper's input terminal. If you are having difficulty with the wiring, refer to the technical section. Push the fuse into the fuse holder beside the power terminals if it isn't already. Connect the power supply to the board using the barrel connector or the power terminal block. Now that you have everything together, let's start using the 1067! In order to demonstrate the functionality of the 1067, the Phidget Control Panel running on a Windows machine will be used. Linux users can follow the getting started with Linux guide and continue reading here for more information about the 1067. Use the Target Position slider to set a new target position. Change the Acceleration and Velocity sliders to speed up or slow down the 1067's approach. 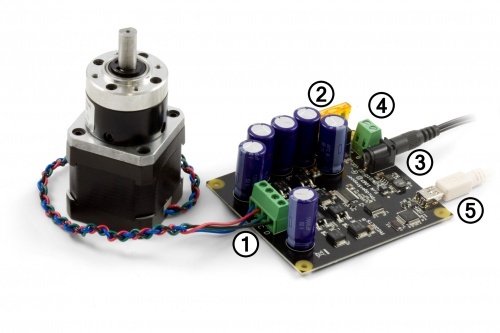 How does the 1067 control Stepper Motors? The 1067 can be used to control a bipolar stepper motor with 4, 6, or 8 wires. 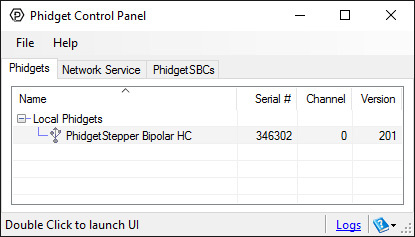 The PhidgetStepper Bipolar is most effective when used with stepper motors designed to be driven with a chopper drive stepper controller. These motors are often large, with a rectangular industrial appearance. The specifications of these motors are often confusing and may seem contradictory. Our users are often confused attempting to relate the specifications of their motor to the capabilities of the 1067. If you are in doubt if your motor will work with the 1067, call us. Unlike the 1063, the 1067 will always micro-step, moving 1/16th of a step for each change in the position variable. 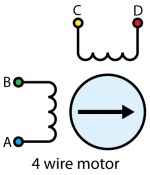 Determining how to connect a 4 wire stepper to the 1067 can be done by following this procedure. Suppose we have four wires: red, green, yellow and blue. The 1067 can operate from 10 to 30 VDC. It is able to reduce the voltage during operation if your motor requires less, but it cannot increase the voltage. First, find the resistance of the coils in your motor. We will assume 4 Ohms. Add 0.5 Ohms to this to account for the electronics on the 1067. 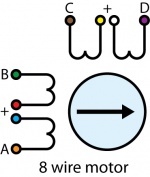 Decide the maximum current you want to push through the coils. This current limit is per coil, and you set this through the software API when you write your application. 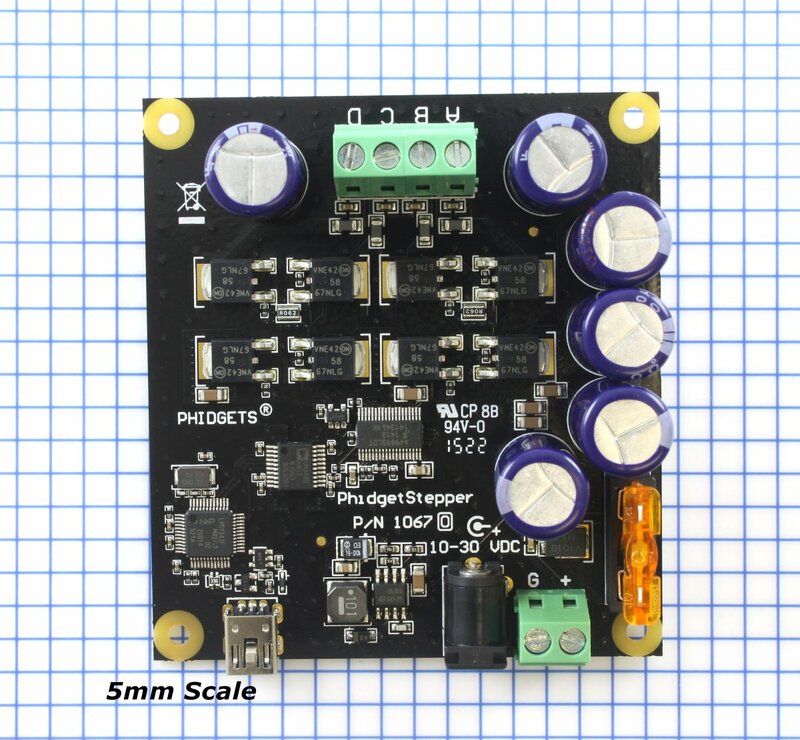 The maximum current for your stepper is part of the motor specification - you can use the stepper with less current, to reduce power consumption, but you will get reduced torque. We'll assume the limit for this example is 2 Amps. Multiply 4.5 Ohms * 2 Amps = 9 Volts. The minimum voltage you can operate this motor at will be 9 Volts + 0.5 Volts for the controller. If the voltage you provide is less than what is required for the motor (but still more than 9 volts), the motor will still run, but not at full spec, and may not step as smoothly as it could. The 1067 allows the current applied to the motor to be programmatically set. This is important - if the current limit is set too high, the motor’s internal resistance will cause the sine-wave approximations used to implement microstepping to clip at the maximum current possible, given your motor/supply voltage. This clipping will cause rough operation, or prevent the motor from turning. If the limit is set too low, the motor may not be able to handle it’s load, by missing steps, or not turning at all at high accelerations. A stepper motor can be caused to rotate continuously by simply setting the motor position property to an extremely large number of steps. The valid range of values for the motor position property is large enough to be able to cause the motor to continuously turn at maximum velocity for several years. You could also reset the current position variable whenever the motor reaches a certain position. If the target position is kept the same, this will also produce continuous rotation. When looking for a motor that will be compatible with the 1067, check the motor's data sheet and make sure it meets the following specifications. Bipolar motor - While the 1067 can control some six-wire unipolar motors, we recommend you look for bipolar stepper motors. 4, 6, or 8-wire motor - A 5-wire motor cannot be used with the 1067, because the coils of the motor are connected internally. Rated Current - The motor should be rated for a maximum of 4A per coil.